Just launched, this "pocket sommelier" uses patented "Visual Search" technology to give you a complete rundown on wines based on pictures you've snapped of their labels, frighteningly similar to the law enforcement technology that's even now linking your face to the selling of a goldfish to a minor in Manchester. Shame! 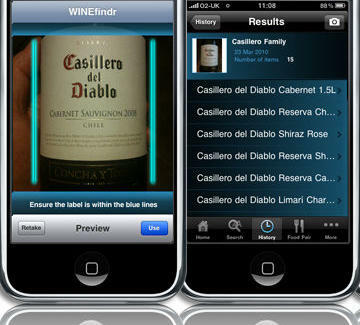 Beyond flashing a rundown of region, vineyard info, user ratings, and average price, the app also delivers a full price comparison for all major UK supermarkets/booze outlets, and even allows you to e-purchase home delivery straight from the retailer; most awesomely, it'll also consider grape/style/acidity/price/'oak level', etc, in order to suggest an alternative plonk, though hopefully not Lovecats Chardonnay. Other usefulness includes a meal-pairing component that actually drills down to cooking technique, sauce, etc, a "Discovery" function (specify wine/food type, country, or price, then shake the phone for a random vino), "Featured" bottles popular with other users, and a retailer-suggestion option sourced from your (anonymous) search history; recommendations get sharper the more you search, until the app's so brilliant it becomes self-aware, and murders Syrah Connor. Because wine makes you forget, the app saves everything in a browsable history, which you can search by label in an iTunes-like "Bottle Flow" -- something you're no stranger to if you buy your Oeufs by the dozen.